Are dips a chest or triceps exercise? The answer is both. Here's your guide to the subtle nuances of each variation to help you maximize your chest and triceps development! Which muscle group the dip effectively targets has been an ongoing debate among gym-goers for decades. Is it a chest builder or the ultimate triceps scorcher? Or is it both? The answer isn't simple, because it actually depends on how you perform your dips. Since dips are a multijoint exercise, there are multiple muscle groups involved no matter how you do them. However, you can execute the movement in slightly different ways, which enables you to place a greater focus on one muscle group or another. Do you know the key differences between these two dipping variations? I'll break it down for you and provide an example of how the dip can work in both a chest workout and a triceps workout. To put the focus on your chest during dips, start by using bars that place your hands outside of shoulder width. If you have access to bars that are wide on one end and narrow on the other, use the wide end for chest work. Many assisted-dip stations have narrow and wide settings in which the ends of the bars can be flipped for a closer or wider grip. Still, some dip stations have only one fixed setting, so just try and find one that's relatively wide. Once you're up on the bars with arms extended, bend your knees and push your legs back as far as possible. This turns your torso more horizontal, which places greater emphasis on your chest. When you lower your body, allow your elbows to flare out to the sides. Stop when your upper arms are about parallel with the floor. Going any lower than that won't add much to chest growth, but it could put stress on your shoulder joint. Focus on contracting your pecs as you press up, and flex them hard at the top without locking out your elbows. While you'll still get some shoulder and triceps involvement—the dip is a multijoint exercise after all—when done in this fashion, you'll put more of the muscular stress mainly on the lower region of your pecs. Because of that, dips can substitute for decline presses in your chest workout. 4 sets of 6-8 reps, rest 2 min. 4 sets of 8-10 reps, rest 2 min. 3-4 sets of 10-15 reps, rest 1 min. 3 sets to failure, rest 1-2 min. Note: If you're strong on dips and want to keep rep counts moderate to build strength (i.e., below 10 reps or so), perform weighted dips. In this case, you can do them earlier in your workout, such as before or after the dumbbell press. Otherwise, stick to bodyweight dips, and simply do as many reps as possible to failure on each set. Shop JYM Supplements In Our Store! When it comes to doing dips for triceps, the body mechanics are pretty much the opposite of what you want to do for chest. For starters, you should use a grip no wider than shoulder width. Opt for the narrower setting on dip bars when possible. On both the descent and ascent of each rep, keep your body as vertical as possible. You can accomplish this by keeping your legs straight down below you, which will position your body more upright and place more emphasis on the triceps. When you lower your body, keep your elbows tucked in to your sides and pointing back behind you. When doing triceps exercises, you never want your elbows to flare out significantly. As with the chest-focused version, descend to a point at which your upper arms are about parallel with the floor, but no further. Focus on the triceps as you push yourself back up and contract them as hard as you can in the top position, reaching full lockout. This last point is important. Locking out the elbows—those last few inches of the rep—is all triceps. Just don't lock out using a ballistic motion. 3-4 sets to failure, rest 2 min. 3 sets of 10-12 reps, rest 1 min. 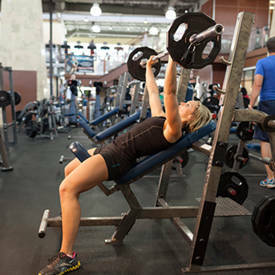 Note: If you're strong on dips, do them later in your workout or weighted early in your training session. If you're not strong, do them first, or use the assisted-dip machine. To focus on strength, keep the reps under 10 per set. The order in which you do dips in your chest and/or triceps workout depends on how strong at dips you are. Here's my rule: If you can't do at least 10 bodyweight dips, do them at the beginning of your workout when you're fresh to help build more strength. Once you can do 10 or more dips with your body weight, though, move them later in your workouts, after your major pressing exercises. 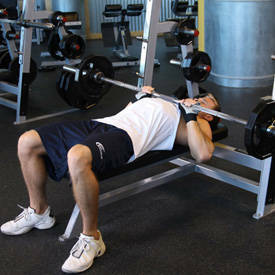 Once you're strong at them, dips make for a great finishing (burnout) exercise for either a chest or triceps workout. Wondering about weighted dips? I think they're great, as long as you approach them correctly. Progress slowly, adding only 5-10-pounds at a time until that ceases to be challenging for your desired rep count. Then move up to a 25-pound plate and go up from there. If you're adding enough weight that it puts you in a low rep range, I recommend doing dips earlier in your routine. When deciding whether or not to do weighted dips, my "10-dip rule" is a good point of reference. If you're not able to do at least 10 consecutive bodyweight dips with good form and full range of motion, you're probably better off not doing your dips weighted. One exception to this rule would be for the person who can do, say, do 9 bodyweight dips, but really wants to focus on upper-body pressing strength with a couple sets of 5-6 reps. In this case, go ahead and add 10 pounds of resistance for the low-rep counts. Should I use the assisted-dip machine? There's no shame in utilizing the assisted dip machine if you can do only a few bodyweight dips; just don't let the machine be your crutch. Make it your specific goal to graduate to bodyweight dips as soon as possible. Better yet, work however many bodyweight dips you can into your assisted-dip workout. 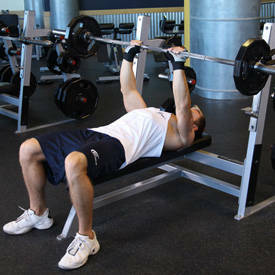 For example, let's say you want to do 3 sets of 12 dips, but you can't do anywhere close to that with your body weight. For each set, do as many as you can unassisted—whether that's 5 dips, 3, 1, or even half a rep—and then, upon reaching failure on bodyweight dips, immediately switch over to assisted dips and rep out until you reach your target. Just make sure you pick the right amount of assisted weight. If you use too much assistance, that 12th rep might be too easy to give you the stimulus you need to get better at bodyweight dips. In that case, lighten the amount of resistance the machine provides on your next set. Remember that in the case of assisted dips or pull-ups, the heavier you go on the machine, the easier it will be. To help you tie it all together, here are a couple sample workouts, one for the chest and the other for the triceps, which incorporate dips. Supercharge your results with Jim Stoppani's Personal Supplement Line!Go Now! Dr. Jim Stoppani Is Our Supplement Guru. His Practices In The Lab And Workout Regimens Are Backed By Science. Go Now!